Thank you again, so very much for my “Play Misty for me”. And all the other goodies!! My mom LOVED it very much! Merry Christmas David the Letterman!!! “Grandma We Love You” was a hit for the St Winifred’s School Choir, appearing on the UK Top of the Pops several times.This year 2012, two sisters will be showing their Grandma how much they love her with a Christmas gift of a framed Lettergraph from www.atozillusions.com, saying “We Love You”The young ladies gave their permission to use this photograph early as Grandma is not into computers or Facebook! Thank you so much for the information on the frames and mounting. Can’t wait to see the product in person! Present for my mum/dad and its the name of their house! I will mail again when the pictures arrive and will probably need some help with mounting the photo again so will speak to you soon! Thank you very much for the amazing present idea, and I hope the company goes massive as it really deserves it! Juno nominated multi-talented country singer Cindi Cain has been entertaining audiences for years with her lively stage presence and unique rare voice. Cindi has appeared on many television shows, her many releases recordings have all on appeared on the American and Canadian country charts, and have played all over the world. Cindy is the owner operator of” “The Voice Shack” her vocal coaching studio and kept busy helping aspiring singers to achieve their goals, both on stage and in the recording studio. My husband passed away on April 11, 2011. When my birthday rolled around later in the month, my girlfriend gave me the gift of a frame with my husband’s name spelled out in pictures of naturally occurring letters found in nature. This thoughtful and unique gift has continued to bring up wonderful memories of my husband. I was so impressed and happy with my gift, that I have since ordered several more gifts from A to Z Illusions for family and friends. I am equally impressed with the great personalized and prompt service that I have received each and every time. This man has truly one of a kind gift. I have never seen anything like it. My first time seeing him was at a craft show in Winnipeg and when I walked by his booth, it stopped me in my tracks. I was with my Mother and I looked over at her and saw a smile on her that I haven’t seen in such a long time. We both fell in love with David’s work and now he is going to be a part of not only my household but many others in my family…not to mention my friends as well. Bravo David for your talent and I’am looking forward to doing more business with you in the up coming years. You will be a part of me now forever. 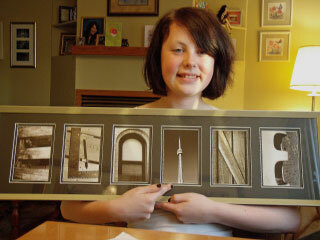 Love the framed lettergraph I bought from you yesterday at the Whistlestop show in Moose Jaw! It will make a great Christmas gift! Great to have bumped into your booth on the weekend in Moose Jaw. We loved your unique letters. Made a great sign for my business Gisele’s Antiques and Collectibles Corner in Regina Antique Mall. I’m sure my customers will love this unique sign. Just wanted to let you know that we are thrilled with our lettergraph of the word “Music” and have it prominently displayed above our piano. The lettergraph is not only a conversation piece but, with it coming so nicely framed, a lovely piece of art that adds to our new decor. We have had many compliments on it and have given your website address out to many people. It was an excellent transaction from the initial contact to the speedy and safe delivery of our package. You’re very personable to deal with and I would not hesitate to recommend A to Z Illusions to anyone. Thanks a million and keep up the lovely work! Thank you for helping my husband and me make our daughter’s 13th birthday a memorable one. 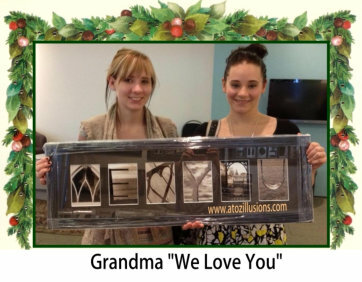 Attached is a picture of her holding her A to Z Illusions picture and the smile she has on her lovely face says it all! I absolutely love my letter pictures, they have gotten so many compliments! 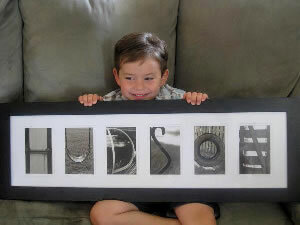 I had the most fun picking the letters that would be best suited for my little man’s name, “Hudson”. It’s a great gift that really is very personal. 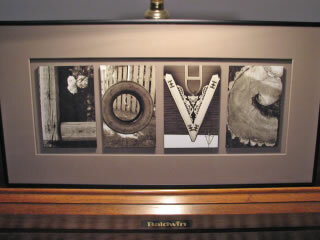 Well, I thought that I would report… the framed “Love” was a hit! The bride who received it as a wedding gift was thrilled. Thank you. This is a truly magnificent concept with quality work. 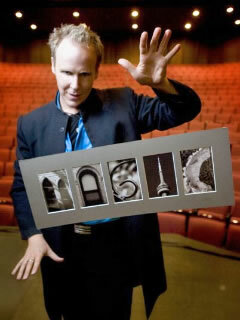 David has the eye of an artist, skilled as a photographer and a wonderful imagination personifying the true art of magic. I just love, love, love my lettergraph! Every time I look at it I love it more in fact. It very “us” as we enjoy photography, nature and architecture. It’s just clever! We ordered two for Christmas and my parents were very happy with the idea and quality. It’s such an original beautiful gift! When I placed the order, I received a personal reply within minutes and shipping was very quick!